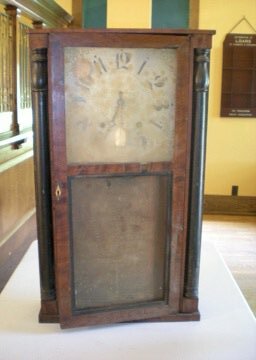 Artifact Archive – New Haven Clock Co.
During the Second Industrial Revolution in the 1800s, American manufacturing boomed. Alongside this growth, the country increased international trade, especially with large European companies. One east coast American business that benefited from this period is the New Haven Clock Company. Founded by Hiram Camp in 1853 in New Haven, Connecticut, the company’s purpose was to supply clock movements to the English big house, Jerome Manufacturing Company; then the largest clock making company in the world. 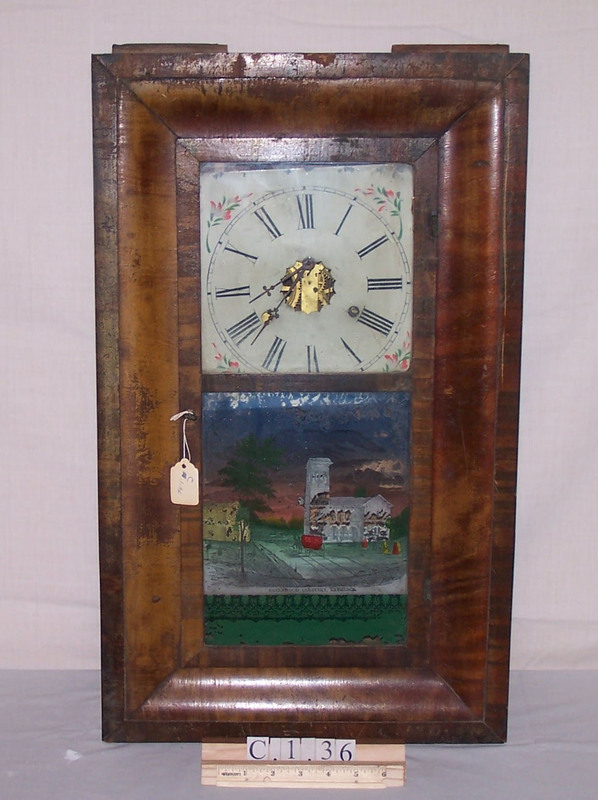 New Haven Clock Company entered the clock making business at just the right time and became profitably strong at a young age. They played their cards right in the United States and in Europe. Within twenty years (1860-1880) they doubled their work force and the number of clocks they produced yearly reached over 1 million dollars worth; which is over 20 million dollars in present day economy. Though the company was profitable, directors and upper management did not manage their finances well. The New Haven Clock Company suffered severe financial hardship, even played with bankruptcy on and off for decades. To stay afloat the company continued to change directors and production paths and supported both world war efforts. Throughout the 1950s the company scraped by but couldn’t keep it together and the doors finally closed for good in 1960. 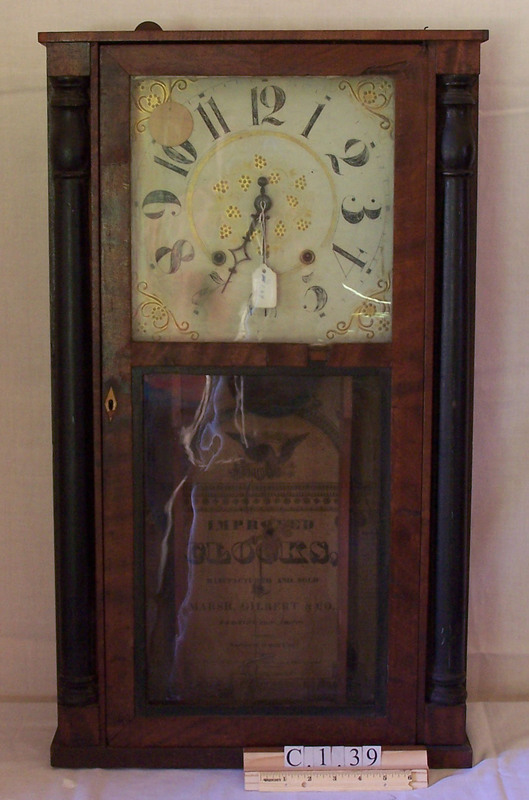 The New Haven Clock Company timepieces can still be found through antique shops, on-line clock collectors and possibly in an old family member’s home. Charlton Park is lucky to have quite a few of these popular, well designed and unique pieces in its collection, as well as other American and European timepieces. Currently, the clocks are stored in a less than ideal place with poor ventilation and not enough space. As the Park intern, this part of the collection has become my project. One by one the clocks are being inventoried, cleaned, documented, photos taken and properly cataloged in the museums computer system. Thankfully room has been made and I’ve been working on designing a more proper storage space for these timepieces. Better lighting, ventilation, climate control and preventions from further damage to these artifacts are top on my list! Cleaning and researching has been the most fun and rewarding, mostly because I can immediately see the good I’m doing. Using a special museum dust cloth and vacuum, I am removing dust and dirt very carefully, making sure not to scratch any surfaces. Once I feel like the majority of the surface is cleaned I then apply a museum-quality wax that not only cleans deeper and adds a nice shine, but hydrates and helps protect the exterior surface from further damage. Glass surfaces are cleaned using ammonia-free products, which are applied to a cloth then gently rubbed on (if you do this at home, do not apply chemicals to paintings on glass!). I truly feel like I’m restoring beauty and dignity to each clock, its designer, maker and past owners. I also feel like I’m setting the clocks up for future success in their new space and in future exhibits. If you are interested in antique clocks the Internet, your local library and the sources listed below are a great place to get started! Thank you for adding the cleaning information. This is very helpful to anyone wnating to clean family heirlooms. You are welcome! Our intern poured her heart and soul into researching and cleaning up the clocks. Glad this was useful! case I’ll be subscribing in your feed and I am hoping you write again soon! Thank you so much, glad you like it! There will be a couple posts coming up in May and then it will be more consistent as the year progresses. Thanks for subscribing! I found a clock somewhat like the one pictured about but more ornate on the top. I would love to show you a photo to see if you have any idea about its history. I do know it is an improved clock by re Northrup new haven Colorado. Tags: Charlton Park, Jerome Manufacturing Co., New Haven Clock Co.